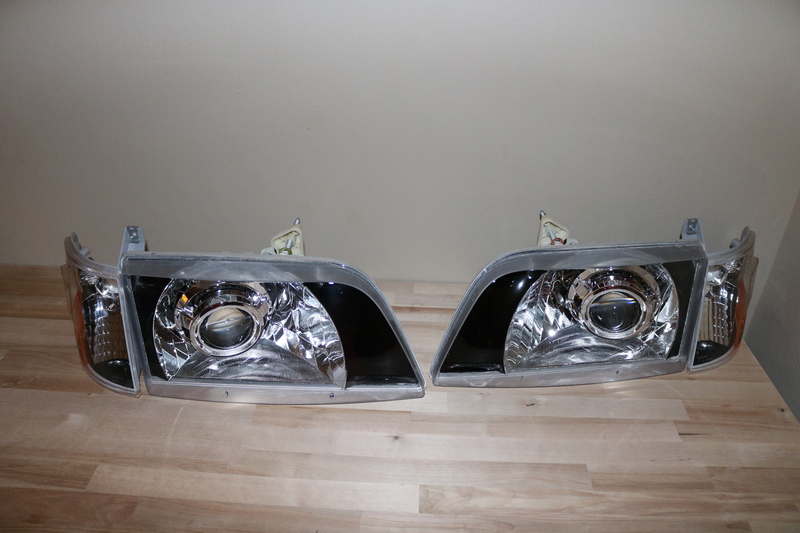 Brand new Volvo VNM headlamp and Sylvania 9007 bulb on left; retrofit kit on right. 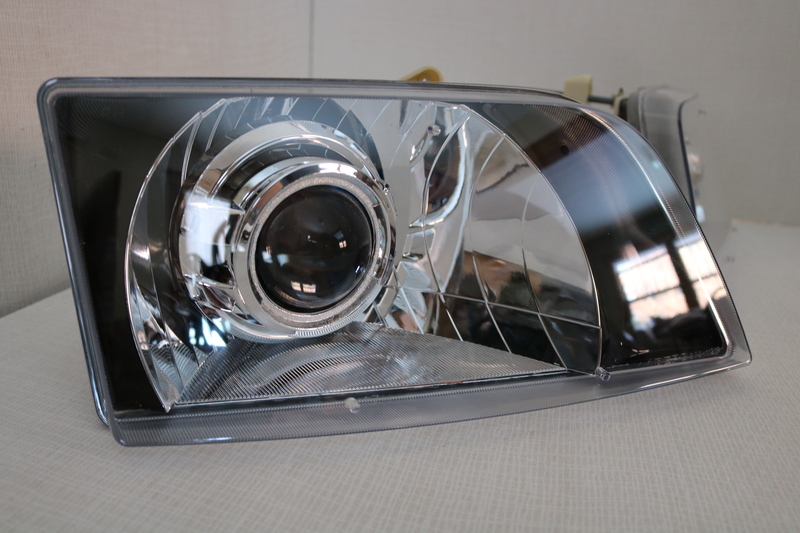 The Volvo VNM kit is designed as a direct replacement for headlamps on all Volvo VNM series (1996-2015) and first generation (1996-2003) Volvo VNL series trucks. 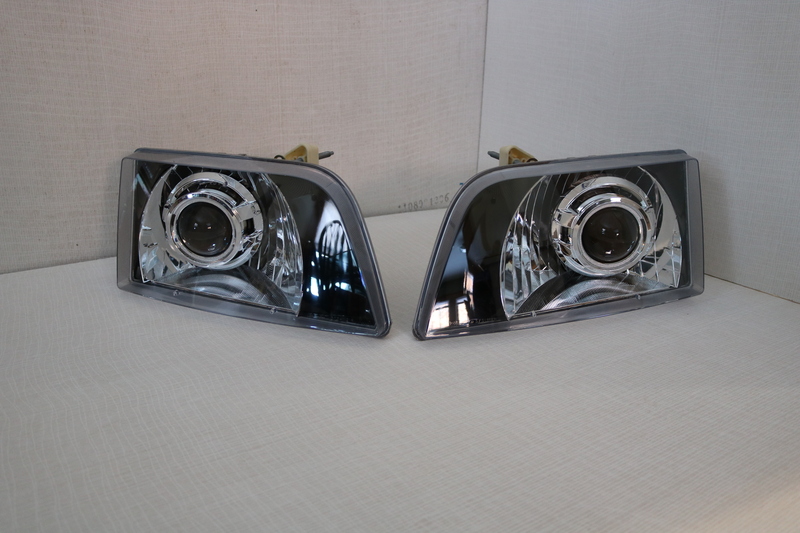 Includes left and right bi-Xenon housings, turn signal assemblies, wiring adapters, ballasts, and bulbs. What’s wrong with the lights that came on the truck? 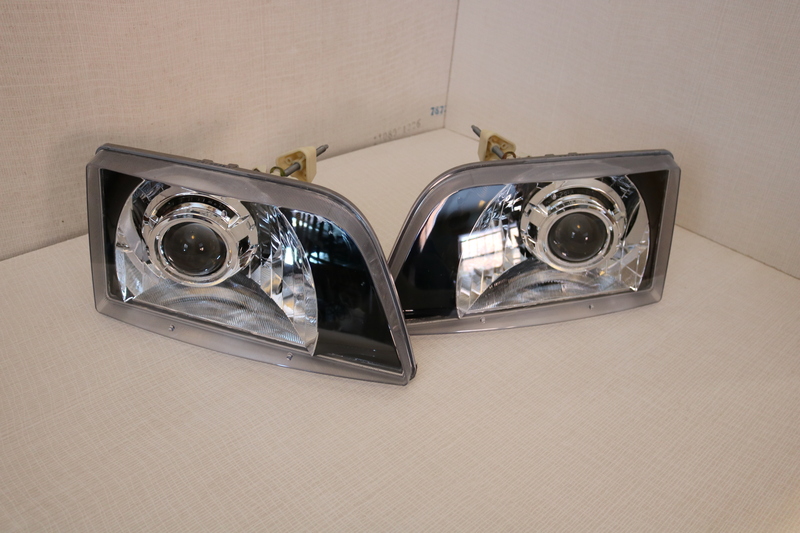 The OEM Volvo lights are prone to weathering, going from a clear outer cover to a milky yellow with age and exposure. This problem is visibly apparent from outside of a truck. The lamp assemblies first went into production for 1996–and haven’t changed since. That’s a lifetime in terms of lighting technology. Now, get the same performance as the kit for second-generation trucks, in an easy-to-install package with everything you need. What about other kits out there that don’t cost nearly as much? 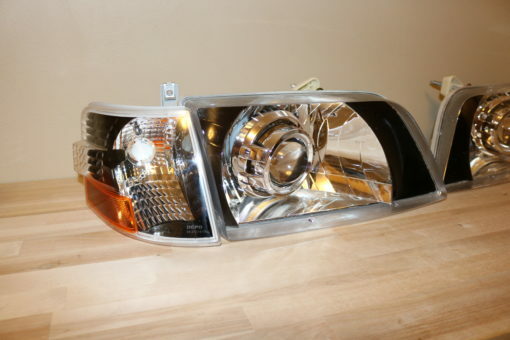 Unfortunately, many HID retrofit kits use generic components, matching only a bulb base. 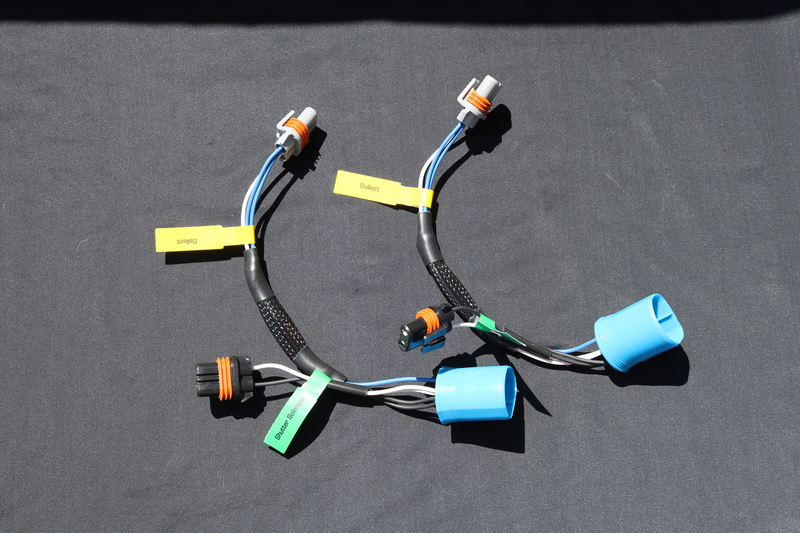 Others include wiring harnesses that just adapt from one bulb type to another. Included ballasts are often of poor quality, and have trouble starting quickly, restarting hot bulbs, or have slight flickers that can be bothersome. They’re the type of kits that NHTSA has ruled can’t be made to meet the performance requirements in FMVSS Standard 108. This kit is different. Why does the Volvo VNM kit cost more than the kit for the other Volvo trucks? The other trucks already use projector-style optics, making replacement a simple 4-screw retrofit. In the case of these trucks, the outer plastic is covered in flutes to achieve the original beam pattern. 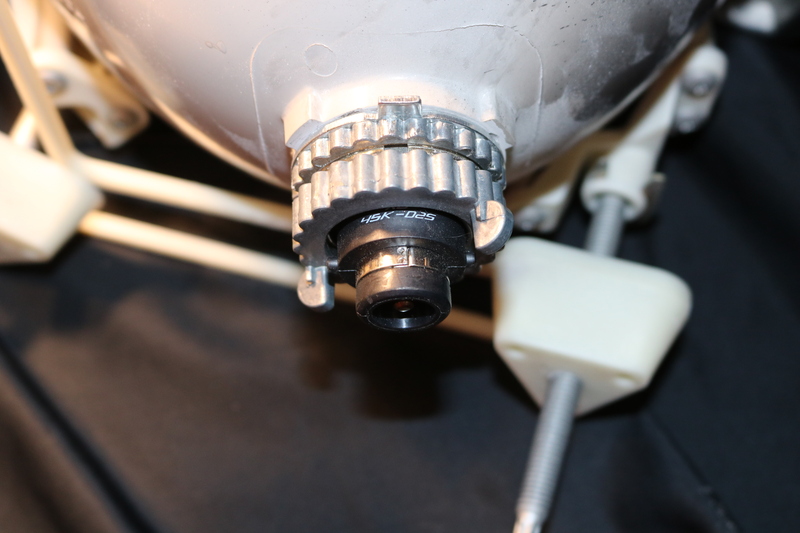 With a projector mounted inside, with the stock lens, the crisp projector output would be distorted. Further, you can’t fit a projector through a hole the size of a halogen bulb base. For this kit, the whole housing is included and pre-assembled. Like the other Volvo kit, there’s no baking, cutting, drilling, or gluing! The benefit here is that for some reason you’re not happy with the kit, it’s just as easy to undo and go back to stock. 2 Wiring harnesses, with every connector clearly labeled. Installation time: Approximately 30 minutes total for both sides.